“They're here to protect the oyamel forests,” said Julian, tour guide at Sierra Chincua Monarch Sanctuary as we passed federal police with assault rifles. “Foreign loggers used to come and destroy them;” the oyamel trees made valuable furniture. Now, logging of the 'sacred' oyamel firs (Abies religiosa) has since ended, according to Julian. 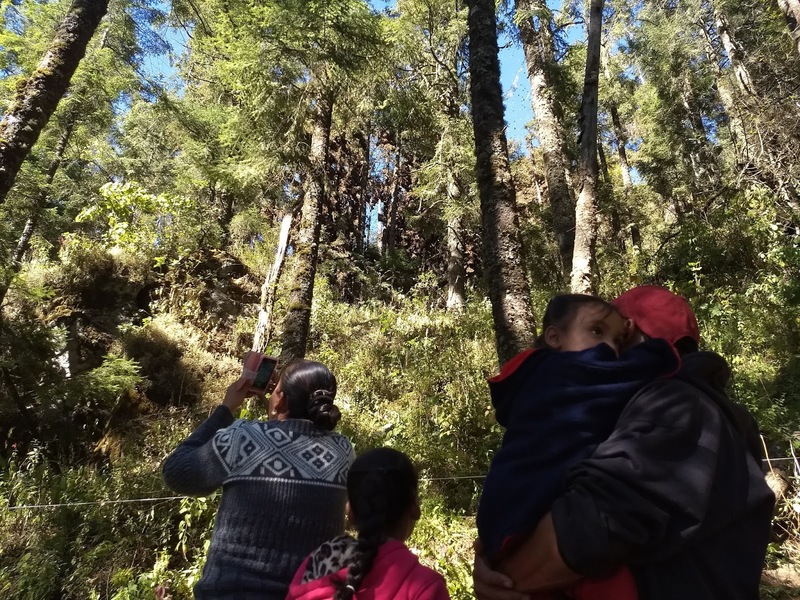 His community depends on healthy forests for their livelihoods, as do the hundreds of millions of Monarch butterflies who migrate here to overwinter every year. “My siblings and I love these forests,” said 15-year old Julian, who also dislikes cities. Aside from recreation, the forests provide food from hunting (squirrels, rabbits, armadillos, coyotes and birds) and foraging. “I collect mushrooms to sell; my family eats a lot too,” said Julian. He also collects and sells firewood, which the majority of villagers still use for cooking and heating. But the elders taught him to do so sustainably and without interfering with Monarch habitat. 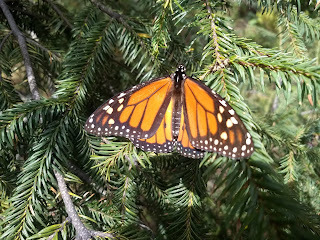 They harvest only pine, not oyamel firs (monarchs overwinter exclusively on oyamel) unless they have fallen and dried. Other forest resources include medicinal and herbal plants, like lemoncillo used for minty teas. Julian showing a "snow" mushroom. And these are just his off-season (non-Monarch) jobs. Between December and March, the monarchs arrive from their 2,000-mile journey through Canada and the United States. Tthey in turn attract 150,000 to 250,000 tourists annually, boosting the local economy which has otherwise been stagnant since the silver mines closed in the 1980's. Hotels, restaurants, vendors and guides like Julian are all profiting or being employed though tourism, as well as the staff throughout the Preserve's five Monarch Sanctuaries. 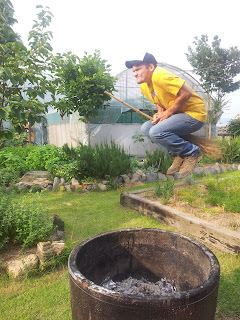 Marcelino, a nurseryman I met near El Rosario Monarch Sanctuary, echoed Julian's sentiment. 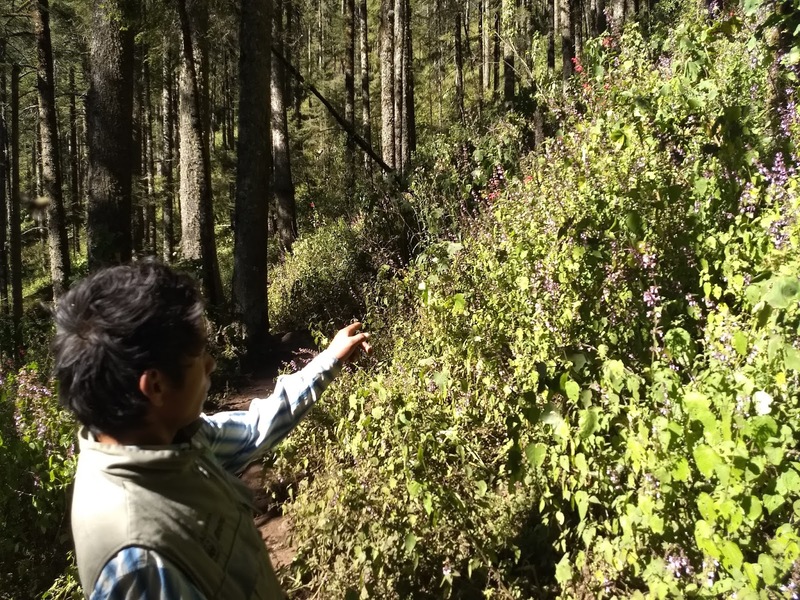 "We use the forests for everything, cooking, heating, sometimes building," said Marcelino. 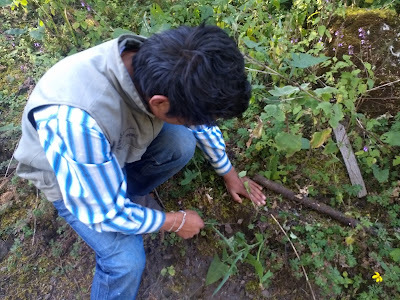 "We only harvest an oyamel that's dead or diseased, and plant twenty seedlings in its place." 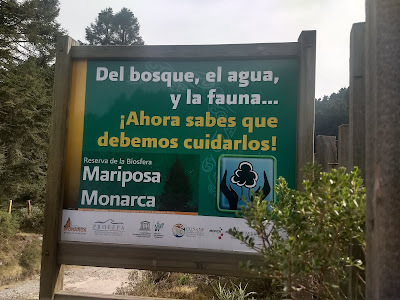 When asked if all the locals share his appreciation of the forest, Marcelino said "of course. 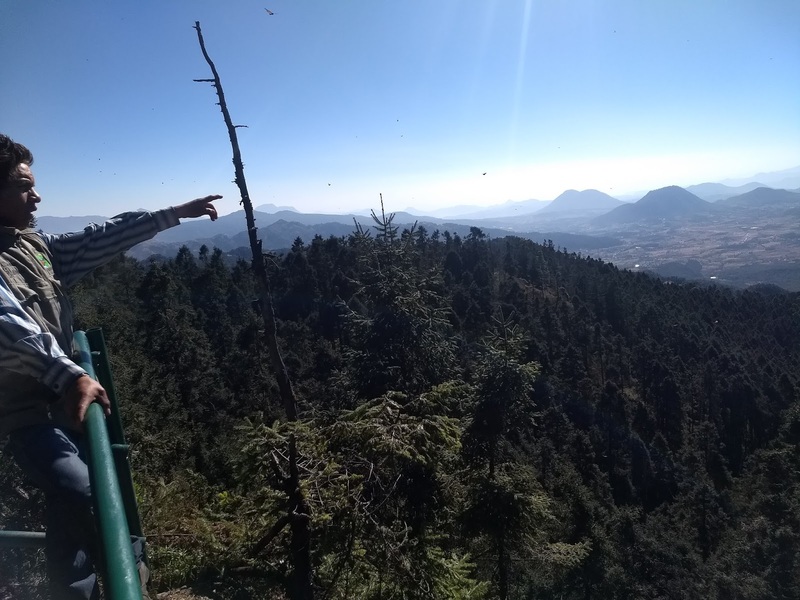 Generations ago these hills were cleared, we've been reforesting them little by little." 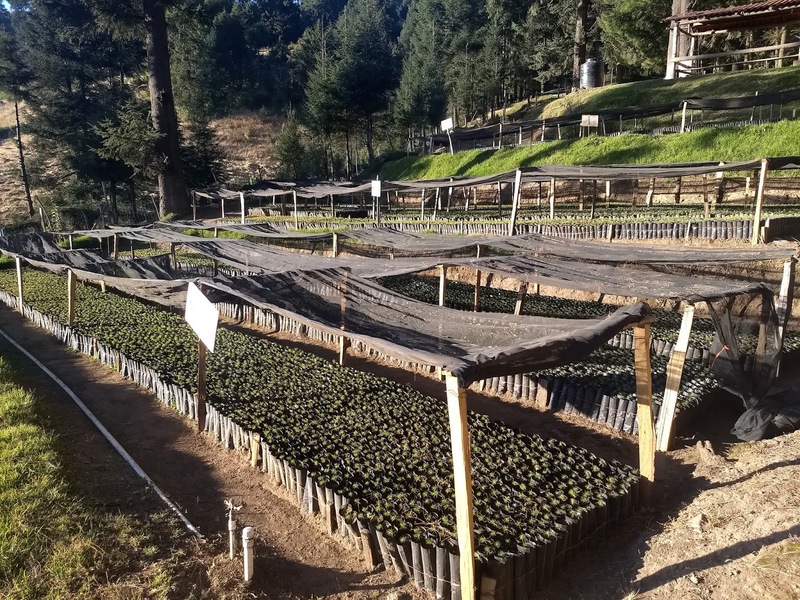 Oyamel fir seedlings at El Rosario's nursery. Marcelino and the other 28 nurserymen at El Rosaria earn 100 pesos ($6 USD) per day, working from 7am to 5pm. "We're happy here. We have one of the 10 Natural Wonder of the world in our backyards," referring to the Monarch reserve, declared a UNESCO site in 2008. He says the nursery and its 20,000 seedling will help reforest the reserve and expand Monarch habitat. "We also give trees to nearby communities who need them," Marcelino said. 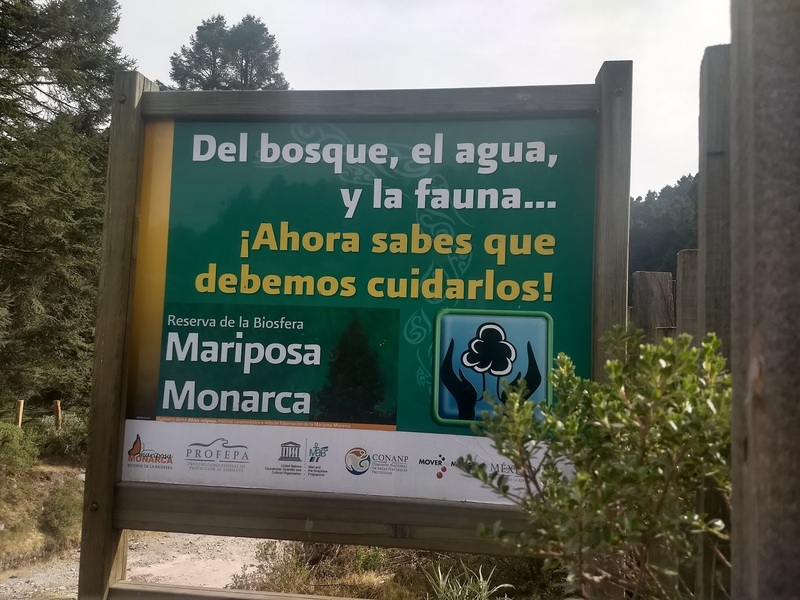 Learn more about Reforesting Monarch Habitat at La Cruz Nursery. 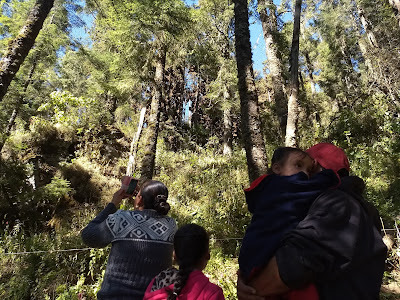 Visitors view the monarch colony from a safe distance. 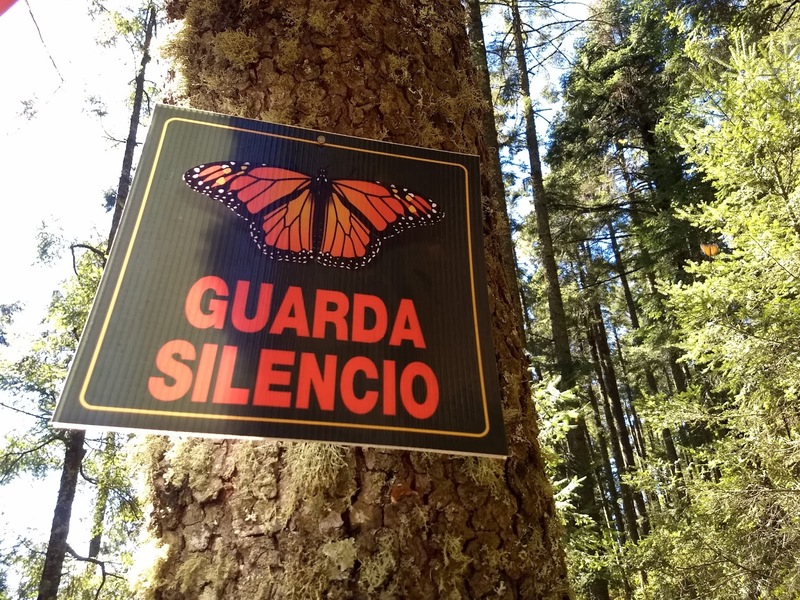 Understandably, because the Monarchs help define not only their economy but their culture, the locals vehemently protect them and their oyamel forests. En route to the main colony, Julian explained the three rules to “respect” the creatures: no talking, no flash photos and no touching. Along the trails were a full spectrum of colorful wildflowers, as well as oyamel saplings planted by the local ejido (community with commonly-owned land). Finally we arrived at the hill, its base lined with silent, awe-struck onlookers, restrained by a rope and volunteer guards from the community. Above, a cluster of oyamel firs sporting their heavy coat of fluttering orange, the air between exploding with movement. 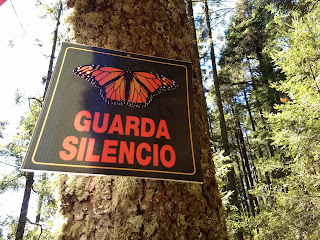 The millions of Monarchs scatter to feed on nearby wildflowers during the warm days, and return to the oyamel firs to huddle together during the cold nights. 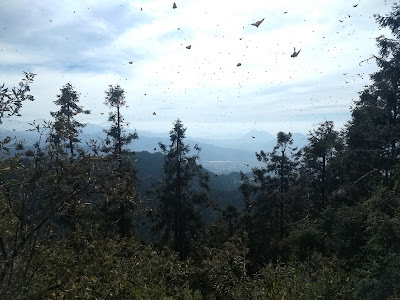 Seeing how they congregate in a central cluster of firs while the surrounding firs shield them from the wind, it's clear, that like the neighboring communities, the Monarchs depend on these forests. millions of butterflies on thousands of Oyamel fir trees. Now you know we need to protect them"
 Ron Mader, “Mexico's MonarchButterfly Sanctuaries,” Planeta.com (Dec. 11, 2017). Andrea Thompson, "Monarch Butterfly Reserve and the rest of the 8 New Natural Wonders of the World." Huffington Post (July 18, 2008). "Why Butterflies Matter," Butterfly Conservation. 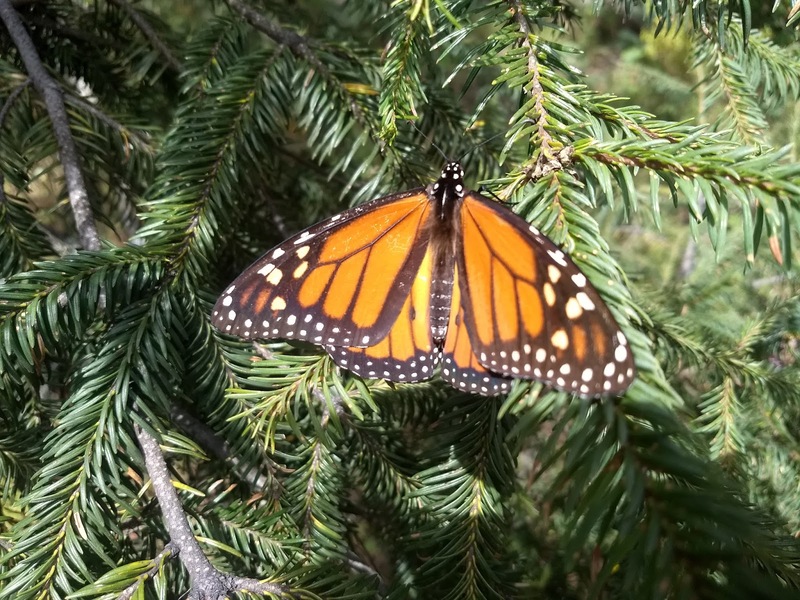 A monarch on an Oyamel fir. Protecting the nature is very important for us. We will not be healthy if we will not have the natural places, and nature itself available to us. I am writing services reviews about places that have been destroyed by the people of that area, or from the higher authorities. Thanks a lot for sharing such information.